What you should know about history to make things better. A critical history-book and a contribution to the enlightenment. 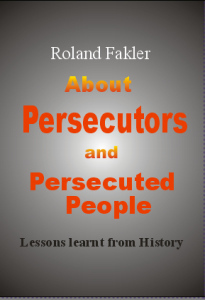 Why “great people” in world history became Persecutors or why they were persecuted. from Akhenaten / Amenophis IV -1350 to Erdogan, from Alexander to Hitler, from old dictatorship to our present dictators, like Assad…. All so called “great men” were great problems, who caused after all great havoc and misery. Even the founders of religion, Moses, Jesus and Mohammed are the root of endless persecution. Why is that? What can we do to lead history on a more peaceful path for the future? That are the topics discussed in this book. For at least five years I have worked on my main work. Now it is available in German and English. What is the reason why the so-called great people in history turned into persecutors, if they had the power to do so, and why were they often persecuted, if they fought against spiritual restriction and sought new ways of thinking as freethinkers and cultural workers? After all, why do people come to persecute others? This central, ever and ever recurring problem in world history, I want to highlight in this book and help so to advance the enlightenment one-step further. Its about an ancient and eternal topic, a topic which I consider the most important in world history, a topic that pervades the whole history and has shaped it decisively. It is about freedom and tyranny, about happiness and misery of people and nations, about just and unjust rule. 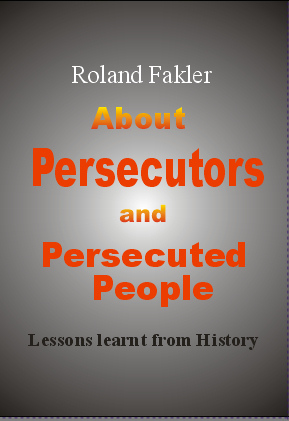 This book is about clarifying, to what extend somebody was a persecutor or was persecuted or to what extend he has added a spiritual contribution to the persecution of others. This book is about the question: how persecution arises, how it is justified and above all, how it can be restricted or prevented. The book wants to arrange easy readable fundamental history-knowledge, confirm this knowledge with quotations, show connections and come to conclusions.